On Monday 5th June at the Messe arena in Düsseldorf, while the world was waiting to watch the thrilling Men's Singles final of the Liebherr 2017 World Championships, a table tennis lover was fighting for his life. Liu Hongqiang from Double Happiness (DHS) suffered a heart attack while working in the training hall. He fell unconscious; immediate medical help saved his life. Liu Hongqiang being transferred to the ambulance at the Messe Arena, Düsseldorf. Today, Liu Hongqiang is back on his feet, has almost recovered and hopes to be back to office this month. Hongqiang has been working with DHS for the last 40 years now, and currently he is incharge of the equipment at all the events. On Monday 5th June 2017 at the Messe arena in Düsseldorf, he was moving the tables in the practice hall from one end to the other to pack them up when one of his colleagues noticed that one of the tables was not moving at all. “My colleague realized that I was unconscious when he found that he could not move the table and I was not moving it either. As he saw me unconscious, he rushed to find our manager. At the same time, Chinese coach Liu Guozheng and German coach Zhu Xiaoyong were in the practice hall to train their players and as they saw me unconscious, they quickly came back with doctors.” he recalled. The coaches rushed to the security guard on spot who quickly informed Mr. Vicent Patrick Fodjeu from Malteser Hilfsdienst (the company responsible for providing medical services at the venue) about the incident. Trained highly to tackle such situations, Mr.Fodjeu along with doctor on venue Ms. Dr.Ritterbach hustled to the training hall to save the life of Liu Hongqiang. He was rushed to the hospital in a fully equipped ambulance and the team made sure that there was no delay in starting the treatment . The immediate medical aid helped save time and Liu Hongqiang regained his consciousness after a couple of hours. After he learned that he had a heart attack and was saved by these incredibly professional people, Hongqiang was thankful to the coaches, Securitas (the company who provided security at the venue), doctors and staff of Malteser Hilfsdienst and DHS for their quick response and help. “The doctor said it could take 12 hours for me to regain consciousness, but I woke up after four hours,” he said. Due to his critical condition, Liu Hongqiang had to be supervised by a doctor on the flight to get back to his home town, Shanghai. “According to the rules of the hospital, I could not travel alone from Düsseldorf to Shanghai; we needed a doctor to company me on the flight. So our company DHS, found a doctor to accompany me from the flight from Düsseldorf to Shanghai,” he added. The team effort was highly lauded by all. 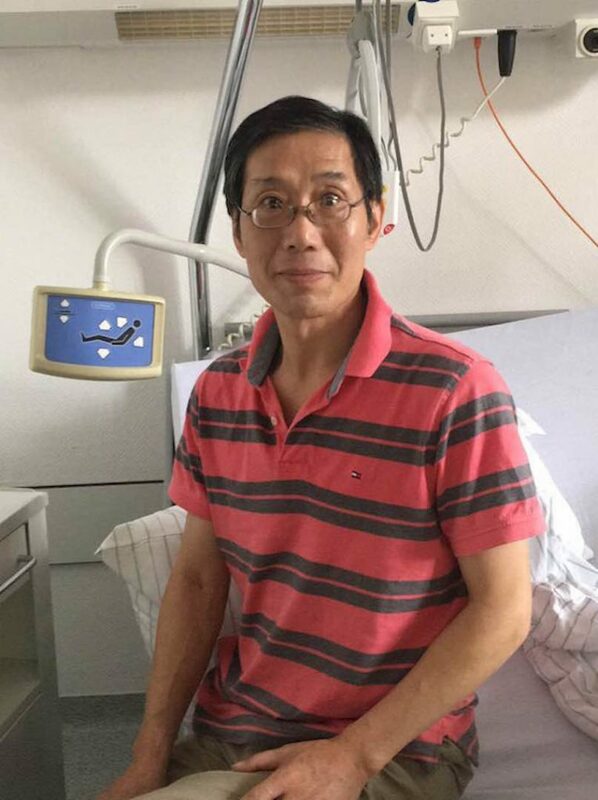 Liu Hongqiang is now back home and is recovering fast. “I am taking good rest at home. I still need to go to doctors next week, and hopefully I will be back to the office in this month,” Liu Hongqiang said looking relieved. As the news broke out amongst those present at the venue, there was one consistent thought: Liu Hongqiang was lucky to be inside the Messe arena, working on a table tennis event. Glad that he was not elsewhere where it would be difficult to get immediate medical help. Thanks to a highly professional team of Securitas, Malteser Hilfsdienst and the coaches who reacted immediately to the situation, a table tennis lover’s life was saved inside a table tennis hall. Liu Hongqiang after regaining consciousness.